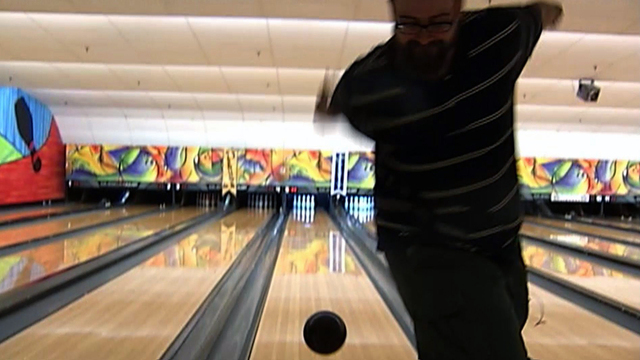 Andrew Cowen is a world record holder in backwards bowling with a 280, but he wants to score a perfect game without even facing the pins, CBS affiliate WIFR-TV in Rockford, Ill., reports. Cowen has spent his spare time on the lanes since he was 10, bowling regularly, and actually threw a 300 the conventional way. So why make the change? "Nobody's thrown a 300 [backward], and I figured it would be a interesting challenge to throw that way," said Cowen. "And it helps because my knees aren't in the best shape, and when I throw backwards it doesn't really affect my knee because there's no knee bend." One of the most common questions he gets is, of course, "How do you do it." "Well you're going to take the ball by your side; you're going to take a step back, push away," said Cowen. "Step two, you're going to have the ball down. Step three, you're going to have the ball forward, swinging from you, and, step four, you're going to throw it back down the lane." When the Rockford native was getting started, he was all on his own. "There wasn't really anybody to role model after," said Cowen. "It's really just something I've had to pioneer on my own and just discover what works." The rarity of backwards bowlers made it tough to start, but now it helps strike up conversation. "That's probably the best part of bowling backwards," said Cowen. "It's a lot of fun. A lot of people come down and say, 'Hey, that's really neat. What's going on? How do you do it?'" The first 300 ever recorded happened in Rockford in 1902. Cowen's goal is to represent the city again by adding the first backwards 300 to the record books.